Throughout history, the love and intelligence of dogs has not gone amiss. While the ancient Egyptians used to worship cats, the modern world seems to worship dogs – and they have even been used within high-profile events in the last few centuries. In fact, German Shepherd dogs were used by the German army during the First World War to allow soldiers and regiments to send and receive messages, as well as vital medical aid. This continued throughout the Second World War, and dogs have since been used within modern militaries to become sniffer dogs, guide dogs, fighting dogs, scouts and more. However, the loyalty and intelligence of these animals aren’t just used within warfare. They are now being used as service or assistance dogs, to help those who have disabilities. Whether an individual suffers from visual impairments, seizure disorders, hearing impairments, post-traumatic stress disorder or another disability, these dogs are able to provide vital support and friendship. While almost all breeds of dogs are able to become service dogs, there are only a few different breeds that are deemed healthy and capable to undertake all of the training – including Golden Retrievers, Labrador Retrievers, German Shepherd Dogs and Labrador/Retriever/Golden Retriever crossbreeds. It was a black Labrador that became a hero this day when one policeman discovered it frantically barking and yelping along a deserted street. Rather than leaving the dog to its own devices, the policeman decided to check out the situation – a decision which allowed them both to become heroes. However, to truly understand this story, we need to start at the beginning. 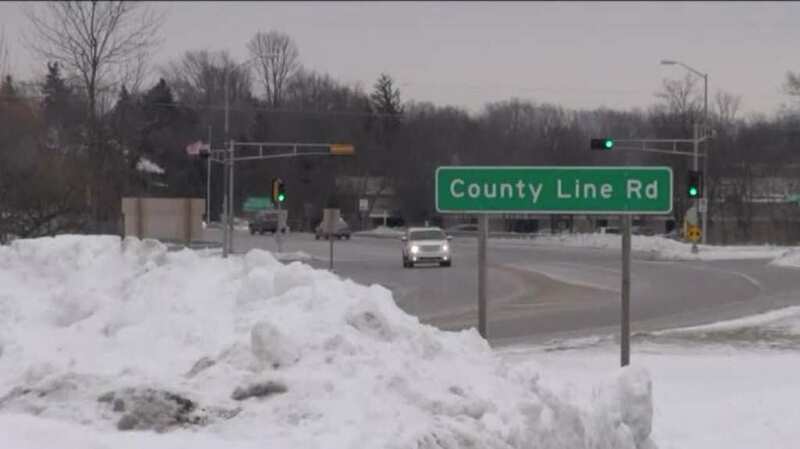 It was a freezing cold morning in Germantown, Wisconsin on February 13, 2015, when Officer Jeff Gonzalez set out for his standard morning patrol. After bitter conditions and snow flurries, the streets and sidewalks were covered in snow – which meant that they were also pretty empty. Yet, it seems the streets weren’t completely empty, as Jeff soon noticed that a black Labrador was running amok in the street. Although he was intrigued, he was a little worried about the dog, so he drove a little closer to check out what was going on. Officer Jeff Gonzalez always made sure that he looked out for his community – whether they were human or animal. Although he had no obligation to keep an eye out for the pets within his neighborhood, Officer Gonzalez went out of his way to care for lost and injured animals, especially when temperatures were so intensely cold. Indeed, he always went above and beyond to ensure that his community was kept safe and well, but he had no idea that it wasn’t the black Labrador who needed help the most. Because of this, Officer Jeff Gonzalez decided to drive a little closer to the black Labrador to see whether it really was just a lost dog. However, as he got nearer, he noticed that the dog was not simply wandering around aimlessly or with a purpose of returning home. Instead, this dog was running around frantically from one end of the street to the other, and barking with all of his might. Officer Gonzalez immediately knew that something was wrong, and knew that he had to try approach the dog to see if he could calm him down. 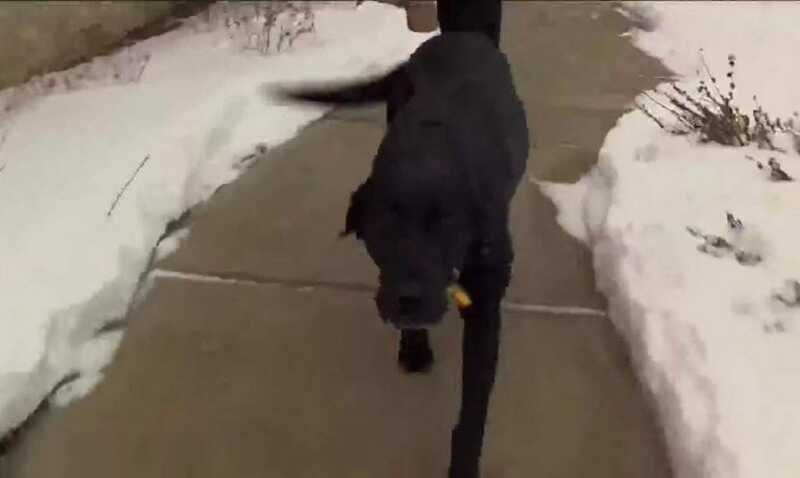 Before the black Labrador ran off completely, he made sure to look back at Officer Jeff Gonzalez – as if beckoning him to follow. 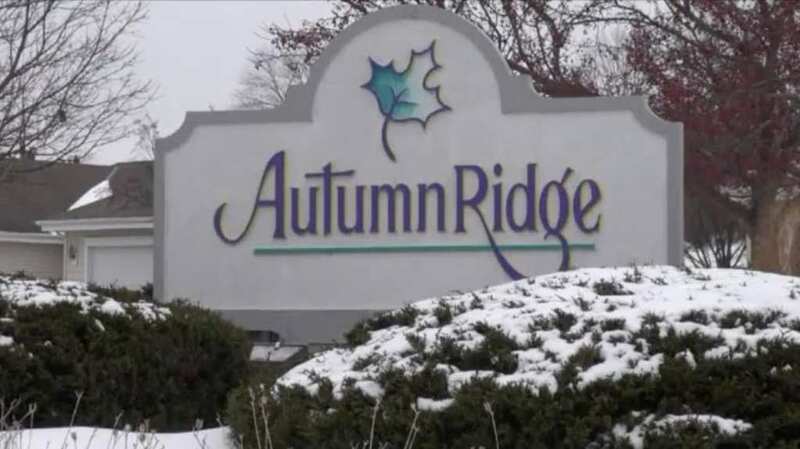 The policeman knew enough about dogs, their instinct and their loyalty to know that it was safe to follow him and let the dog lead the way to the small residential area of Autumn Ridge. 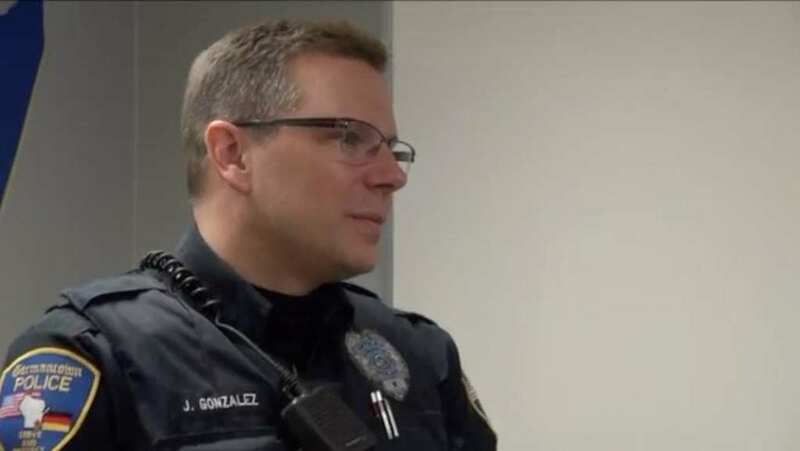 As Officer Gonzalez continued to follow the dog along the sidewalk and ever deeper into the neighborhood, they soon turned off into a local driveway – which was when Officer Gonzalez realized what was happening. 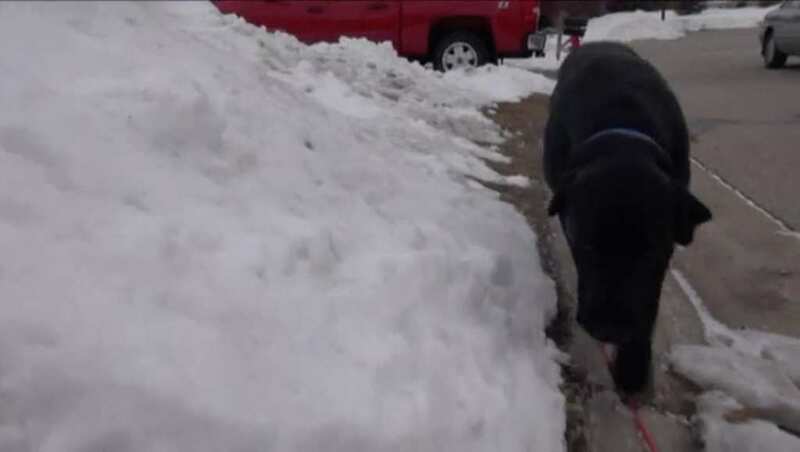 As Officer Jeff Gonzalez followed the black Labrador further up the driveway, he noted a woman sitting on the porch of a local house. However, he could immediately tell that something was wrong. Although it was not uncommon for people in the neighborhood to sit on their porch, there was something about this woman that didn’t seem natural. She was slumped over and seemingly unconscious. As if by instinct, Officer Gonzalez rushed over to the woman, but knew that things were worse than they seemed. Speaking to Fox6Now after the event, Officer Gonzalez spoke of the emotions and the thoughts that went through his head when he followed the dog and found the woman. Immediately, he thought that the woman he had found was dead – as when he touched the woman, she was ice cold and had blue lips. However, it seemed as though the policeman had turned up just in time, as he could still feel a faint pulse. As soon as he realized that the unconscious woman was still alive, he immediately reached for his radio and called for help. 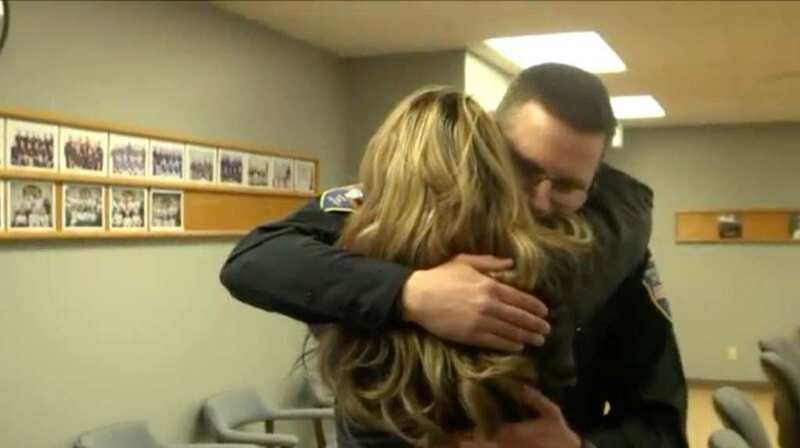 As he waited for an ambulance to attend to the woman, Officer Jeff Gonzalez knew that he needed to take the woman out of the cold and into the warm of her house. So, he called for backup from an officer that was nearby – and the pair carefully carried the woman into her home. As time ticked on, the two police officers decided to learn more about the unconscious woman, and soon discovered that she was called Krystal Wendt. Although they were dreading the call, they both knew that they needed to call Krystal’s next of kin. As they found the number of Krystal’s daughter, Tianne Wendt, both Officer Gonzalez and his partner made the dreaded call and informed Tianne of her mother’s condition. On the phone to Tianne, Officer Jeff Gonzalez noted that he thought her mother was dead, but that an ambulance was on the way. Naturally, Tianne was overwhelmed with the news and tried to fight back tears. Nevertheless, she gathered her aunt, told her the news, and rushed to the hospital where Krystal was taken, where they could only sit and wait for information about their mother and sister. As Tianne and her aunt waited impatiently in the hospital, they were eventually given answers – and Krystal Wendt was given a diagnosis. She was told that her unconscious decision was caused by a heart condition she had no idea she had, and that Jeff Gonzalez had found her at the right time, as she had already been unconscious for just less than hour before she was found! Of course, the doctors, Krystal, and her family couldn’t help but sing Officer Gonzalez’s praises, but there was also someone else to thank… the black Labrador. As Krystal remained in hospital. Officer Jeff Gonzalez vowed to learn more about the perfect pooch that had made him aware of her unconscious body. Before too long, he had discovered that the black Labrador was called John Boy. 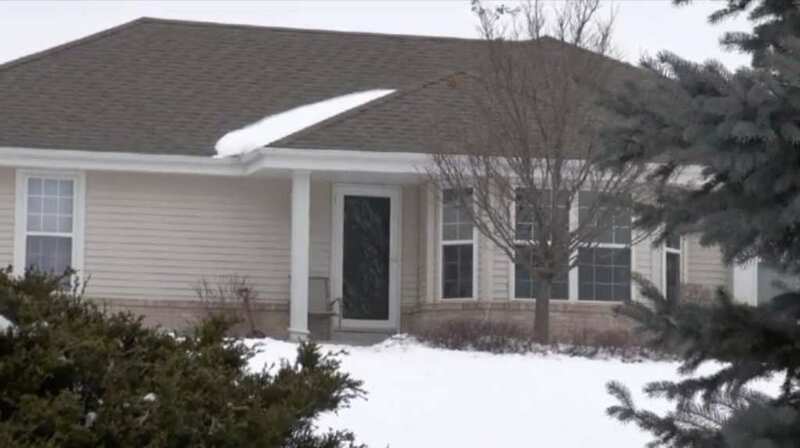 After the event, he spoke to Fox6Now about the the steps that led him to Krystal on her porch, and noted that he believed John Boy had “pointed me in the right direction,” and he could tell that John Boy had a huge amount of love and compassion for his owner, and would do anything to keep her safe. However, the Wendt family believe that John Boy’s love for Krystal is so much more than a dog’s love for his owners. This was because John Boy was taken in and rejected by a whopping three families before Krystal picked him up from the shelter. Rather than seeing this as bad luck, Tianne Wendt believes that the pair were meant to be together. In an interview with Fox6Now, she noted that “He’s very protective of my mom” – and that much was definitely clear after the events that day! 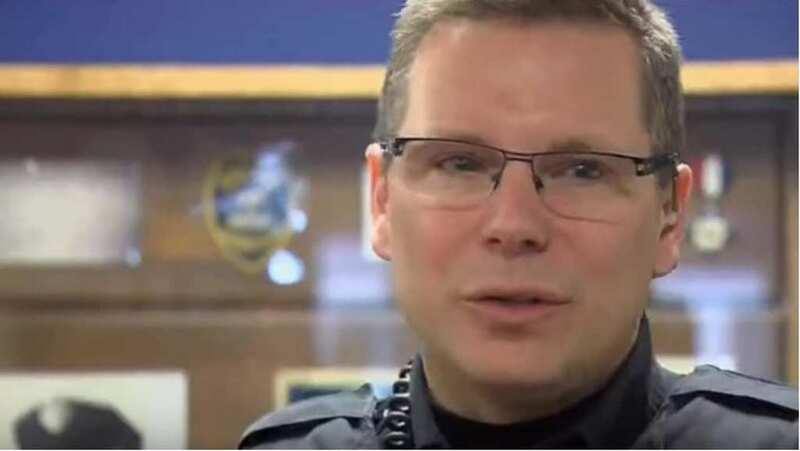 Before too long, news of the incredible story of John Boy and Officer Jeff Gonzalez had reached the local news station, and Fox6News had followed the recovery of Krystal Wendt and her return back to full health. While she continued to stay in hospital for a few more days after the incident, Krystal was in a stable condition, and knew how she could treat and contain her newly diagnosed heart condition. According to Tianne, Krystal was incredibly excited to be reunited with her beloved John Boy, and to meet the man who had managed to save her life. However, while Krystal was still in the hospital, Tianne Wendt knew that she had to thank Officer Jeff Gonzalez herself. Amazingly, the Fox6News cameras caught the whole exchange on camera – and it was one that would put tears in anyone’s eyes. As the pair set eyes on each other, Tianne couldn’t help but engulf the police officer in a big hug to show her gratitude. Thanks to John Boy and Officer Gonzalez, her mother was still alive, and that is something she could never repay. They were both true heroes. 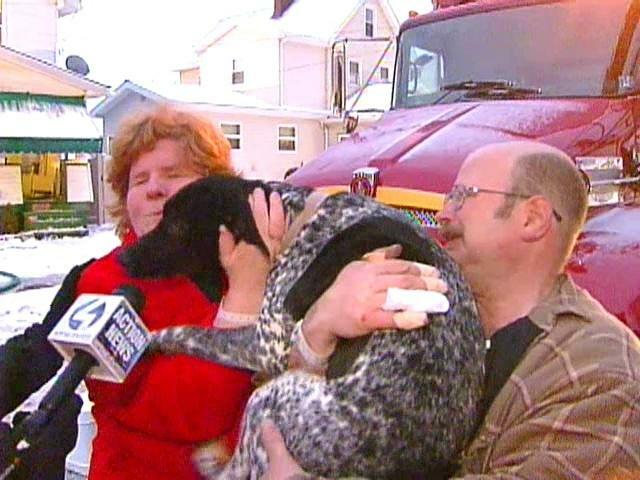 However, John Boy isn’t the only pooch who has saved the life of his owner. In 2014, Omar Persisco was taking his dog Max out for a walk in a Brazilian field when he was accosted by two violent robbers. After Omar refused to hand over his car keys and his wallet, the robbers pulled out a gun and shot a bullet towards him – just slightly grazing his head. 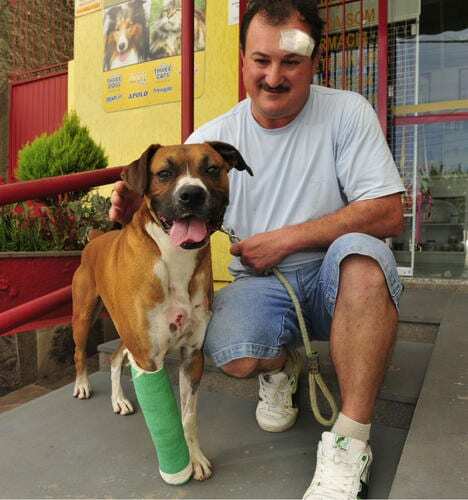 Immediately, Max rushed to defend his owner and was shot in the leg and the chest, while Omar ran away. Max also managed to escape from the robbers and made a full recovery. While dog-sitting a Pomeranian-Poodle by the name of Bandit, the DeStefani family were saved by their very own animal smoke alarm – and owe their lives to Bandit. After placing a plastic hairbrush into a pot of boiling water in order to sterilize it, Rich DeStefani forgot to turn off the stove. By the early hours of the morning, the water had evaporated, and the plastic was being cooked, letting off toxic plumes of smoke. Although the house was fitted with smoke alarms, they did not go off. Thankfully, Bandit jumped on Rich’s wife until she woke up, and forced the rest of her family out of the house. Just like Bandit, a dog named Hero proved that he was more than capable of saving his family from a devastating fire – and their story is one that’s even more heartwarming. 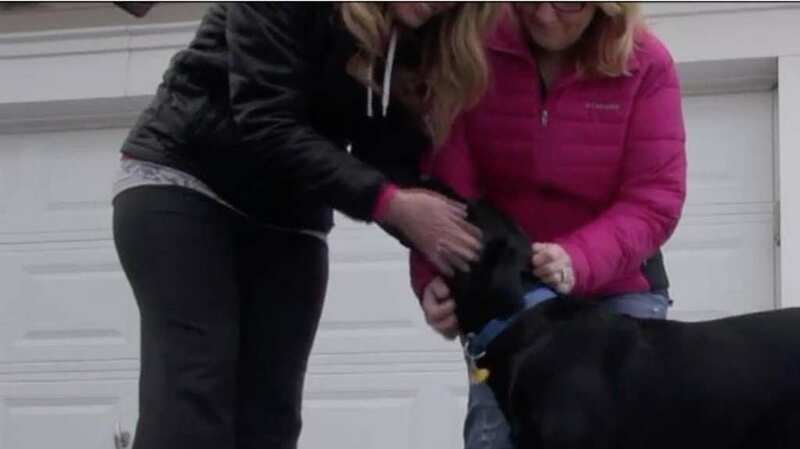 Belonging to the Rankin family in Pennsylvania, their dog Hero was severely injured after being involved in a road traffic accident, and there was little chance of a normal life afterward. However, the Rankin family knew that they couldn’t put Hero down, and decided to give him another chance at life. It seems they made the right decision, as just a few weeks later he woke them up after their fire alarms failed. In a story very similar to Officer Jeff Gonzalez and John Boy’s – the story of Ben Heinrichs and his perfect pooch, Buddy, is one that will repair your faith in humanity. Hailing from Caswell Lakes in Alaska, Ben Heinrichs was working in his car repair shop after a faulty heater caused gasoline within the shop to set on fire. Sadly, Ben was in the firing line of the explosion and suffered intense burns to his hands and face. Almost by instinct, Ben removed himself from the shop and rolled around in the snow to treat his burns. 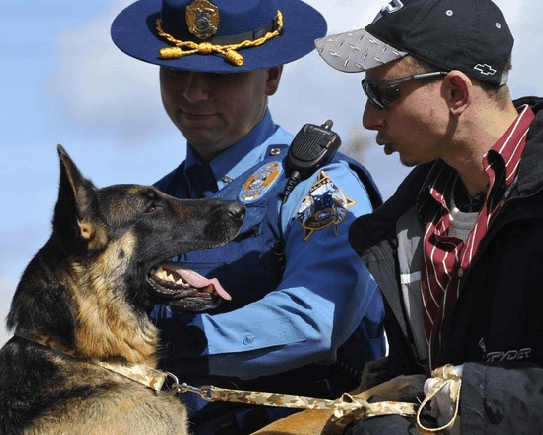 As soon as he was aware of what was happening around him, Ben told Buddy, a German Shepherd, to run and get help – which is exactly what he did. 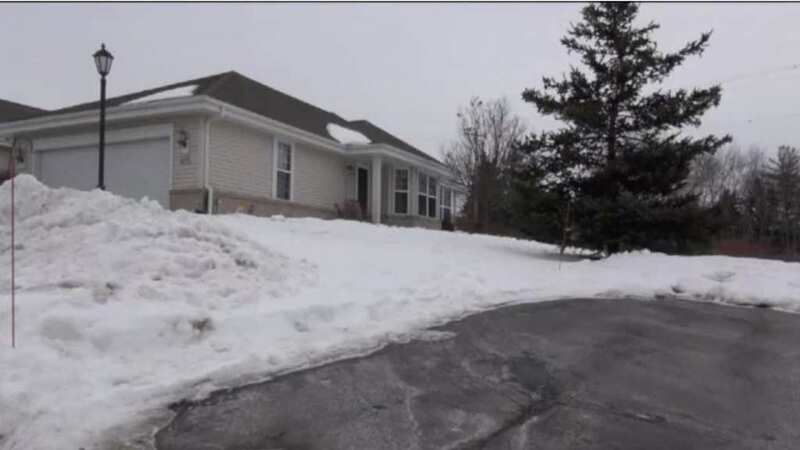 While the emergency services had already responded to a call from a neighbor at a fire, the State Trooper’s vehicle GPS system was faulty, which meant that they could not find Ben’s garage to check out the scene. 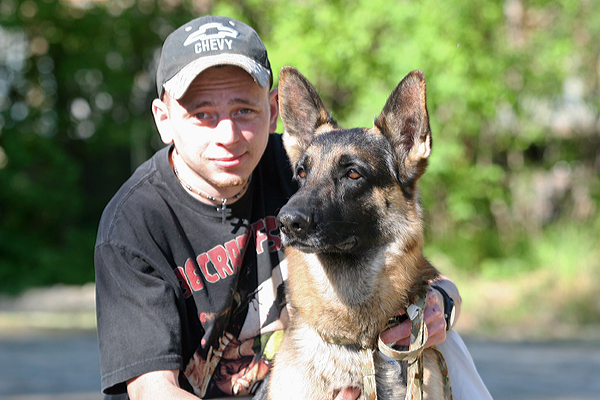 Luckily, Buddy was on hand to direct State Trooper Terrence Shanigan to his wounded owner. Just like Krystal, Ben now owes his life to his dog.